So as I said in my last post, all our friends are having babies at the moment. This is a gift for Nicholas, who was born 11 days ago. Yesterday we got to meet him for the first time and have newborn cuddles. He was so sweet - I love that new baby smell. The shoes are made using a modified version of this pattern (I construct them differently to make them reversible). 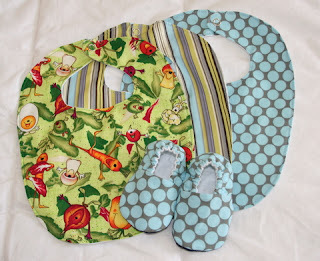 The bibs are made from Amy Karol's great pattern in Bend The Rules Sewing. The dots and stripes fabric are both Amy Butler, the vegetable fabric is Michael Miller. So cute- thanks for the reversible tutorial link! I love the vegetable fabric!